Jeff’s daughter and niece catching fish with Kylie for the day! As the Eastern Regional Director for the C.A.S.T. for Kids Foundation, I (Jeff) am blessed to be able to travel to events throughout the country to meet many wonderful children, their families and the awesome volunteers that make our C.A.S.T. for Kids events happen. 2018 has been a great year and I have been able to attend events from Connecticut to Texas and from Florida to Oregon. The focus of our events is bringing a day of joy and fishing to kids and their families while on the water. Many of these children have never been able to fish, let alone ride in a boat. This year’s events reminded me how awesome it is to see the impact these children have on the volunteers as well, especially our Boat Captains. While on vacation this summer, I was able to attend a C.A.S.T. for Kids event in my home state of Oregon. The event needed a few more boaters so I was glad to come help out. 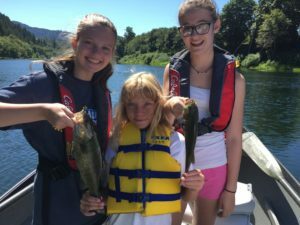 Using a borrowed boat, my daughter and niece assisted as co-captains for the day and we were able to take a young girl, Kylie, and her father fishing on the Umpqua River. I had forgotten how excited someone who has had little fishing experience gets when the fishing action gets good. The day could not have been better. We caught nearly 40 fish, and Kylie and her dad loved every minute of it. What was even better for me was to see my daughter and niece help out with baiting and unhooking fish. They even handed off their rods to Kylie when they had another fish hooked to let her reel them in. We ALL enjoyed the day just as much as Kylie. The impact it had on me is hard to put into words but comments from Kylie to my niece and daughter such as “Will you sit with me at lunch?” and her father talking about purchasing a boat and finding places nearby to take Kylie fishing made the day’s event even more special. To top it all off, my daughter said this was the BEST day of fishing she had ever had. I drove home feeling truly blessed. I had received a “GIFT” that I wasn’t expecting. Jeff and Aaron catching a special thrill on a boat ride! In September, I attended an event near my home at Weiss Lake in Alabama and brought my boat in case it was needed. I was able to take a young boy and his dad out for some fishing and boat riding. Aaron loved to go FAST! It was just a joy to ride up and down the lake a few times, letting Aaron enjoy the thrill. 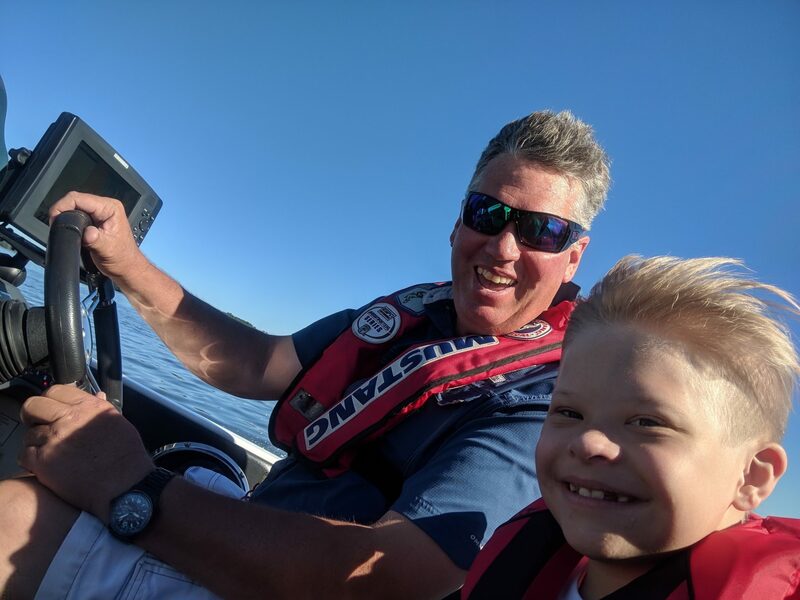 I was able to give some other children a ride as well and can still hear their giggles and excitement as I drove the boat on plane and shot across the lake. It suddenly dawned on me that this common boating activity that I’ve always taken for granted was making these kids day! They absolutely loved it and again I received the “GIFT”. Our events are a fantastic way for people to get involved and help out some children who may be less fortunate. I sincerely encourage anyone who owns a boat to consider participating as a boater in one of our upcoming events. The impact on the kids and their families is so obvious and will truly make it worthwhile. I can also assure you that you will receive your “GIFT” as well. There is no better feeling in the world.